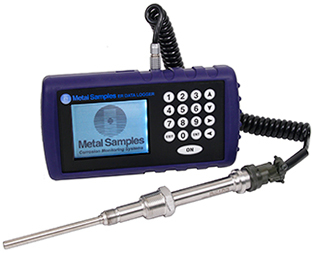 The MS4500E is a hand-held, battery-powered, corrosion meter capable of measuring and storing data from all types of electrical resistance (ER) corrosion probes. The instrument is light weight, microprocessor-based, and features a simple, menu-driven interface using a keypad and a backlit graphical LCD display. Corrosion rate measurements are made using the electrical resistance method. Essentially, the instrument measures the resistance of the probe element which changes over time, as metal loss occurs. The rate of change is directly proportional to corrosion rate. This method finds a wide variety of applications since it can be used in conductive and nonconductive environments such as petroleum, chemical, water, soil, or even atmosphere. The new high-resolution measurement of the MS4500E detects smaller increments of metal loss, providing faster response than traditional ER instruments. After taking a reading, the instrument displays metal loss in mils and corrosion rate in mils per year (mpy). The reading can then be stored to memory or discarded. All stored readings are automatically time and date stamped. Readings are stored to non-volatile Flash memory which retains data without the need for a battery backup. 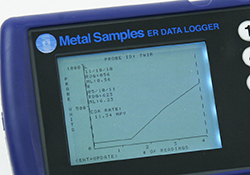 The MS4500E can store 16,000 readings per probe on up to 250 different probes (4 million total). 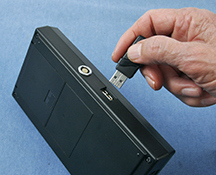 Stored data can be downloaded directly to a USB Flash (“jump”) drive in non-hazardous areas. Data can be opened and charted using the provided Corrosion Data Management software, or can be imported into any standard data analysis (spreadsheet) program such as Microsoft Excel. Data can also be reviewed and charted on the instrument’s LCD display for quick reference.